(Chillicothe, Ohio: August 8, 2018) – Petland is proud to celebrate more than 350 wishes granted during its 20-year relationship with Make-A-Wish® America. Safari Stan’s Children’s Charities by Petland was formalized in 1994. Petland has two children’s charities – Make-A-Wish and St. Jude Children’s Research Hospital. Annually, Petland collects funds year-round for St. Jude, collecting nearly $500,000 since 2009; and, since 1998 has fulfilled more than 350 wishes for Make-A-Wish kids who wish to have a pet. Make-A-Wish is the nation’s largest wish-granting organization. It has fulfilled the wishes of more than 300,000 children with critical illnesses in the United States and its territories since 1980. Headquartered in Phoenix, Make-A-Wish serves every community in the United States, Guam and Puerto Rico through its 62 chapters. Petland works with Make-A-Wish and is notified when there are children with pet-related wishes in order to send care packages to the “wish kids” and their new best friend. 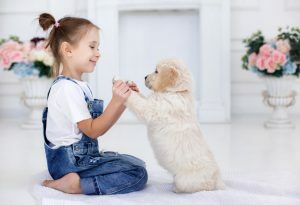 If a child is near a store and is able, Petland stores will host a shopping spree for the family. Make-A-Wish is a 501(c)(3) tax-exempt organization that relies on the generous contributions of generous donors, supporters, staff and more than 35,000 volunteers across the U.S. to grant a wish every 34 minutes, on average, somewhere in the country. Since 1980, Make-A-Wish has granted more than 300,000 wishes to children in the U.S. and its territories; more than 15,400 in 2017 alone. These wishes are an integral part of a child’s treatment because research shows children who have wishes granted can build the physical and emotional strength they need to fight their illness. For more information about Make-A-Wish America, visit wish.org. Petland, Inc. is a franchise operation with quality, full service retail pet centers across the United States, Canada, China, Mexico, South Africa, Brazil and El Salvador. For more than 47 years, Petland Pet Counselors have been dedicated to matching the right pet with the right person and meeting the needs of both. To its customers who already have pets, Petland is dedicated to enhancing their knowledge and enjoyment of the human-animal bond. Petland was founded in 1967 and is headquartered in south central Ohio. For more information on Petland, visit www.petland.com. 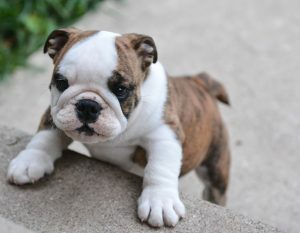 At Petland, our English Bulldog puppies for sale are one of the most loved and recognized! They’re noticeable almost immediately because of their short and broad bodies and small smushed faces. Their expressive eyes and jaws are also unique to Bulldogs. One thing is for sure; they stand out from the crowd! Want to know more about these beauties and their history? Continue reading to learn. Did you know that there are several different types of Bulldogs? There are American Bulldogs, English Bulldogs, French Bulldogs, and Olde English Bulldogs. Each of the breeds possesses different histories, different looks, and even different temperaments. However, what all Bulldogs have in common is a somewhat painful past. They were used for bull baiting, which is how they received the “bull” part of their names. What is bull baiting and how were English Bulldog puppies for sale used? Bull baiting is when a dog makes its body as parallel to the ground as possible and sneakingly dashes out to bite a bull in the nose or its head area. Unfortunately, like other dog fight events, bull baiting was also considered a recreational sport. As you can imagine, this was an incredibly cruel experience for all animals involved. All the breeds of dogs that were also engaged in bull baiting had strong jaws, massive heads, and muscular bodies. These dogs also had stoic and determined temperaments, like Pit Bull Terriers. Thankfully, bull baiting was banned in 1835, due to the support of the Cruelty to Animals Act passed in the Parliament. Today’s English Bulldog puppies for sale are purchased with much purer and humane intentions. They serve as loving pet companions across the world in homes with kids, both young and old! Give us a call today or visit our store to learn more about our English Bulldog puppies for sale!